The Deviant Standard - Traders' preparation for volatile markets. Overnight France committed to a massive austerity plan aimed at reducing its outsized budget deficit to a mere 3% of GDP by 2012, downfrom its current 8%. Half of the reduction is to come from spending cuts, so the other half follows automatically from the tried-and-true economic concept of cutting to prosperity. When asked if he thought the Euro would reach parity with the U.S. Dollar and spur export demand, Prime Minister Fillon commented, “as a policy we do not like to benchmark ourselves against any currency featuring George Washington, France always preferred men like Thoman Jefferson.” He went on to cite several signs of economic activity, including strong 2012 hotel bookings in Brittany as France tries to woo Olympics fans to their side of the channel as well as a large pending Airbus order from Mattel. Just as texbook authors are hurrily trying to update Introduction to Economics texts to replace the discussion of ’supply side stimulous ‘and ‘demand side stimulous’ with coverage of the ‘other side of the rainbow stimulous’, they’ve decided to remove the long standing example of guns vs. butter. The new gold vs. opium discussion was prompted by an overnight announcement that nearly $1 Trillion in mineral deposits have been identified in Afghanistan. Also overnight, a Bureau of Printing and Engraveing spokesman announced that once again, U.S. nickels will be produced primarily from nickel. They expect to maintain the current design featuring Thomas Jefferson. We were wrong about our outlook for today — well, partly wrong. We had specific plans for what to do if we exceeded Wednesday’s highs, even though we were expecting things to go lower. Nevertheless, days like this should raise many questions. In an abbreviated issue tonight (PDF) we look at some of those questions as we prepare for Friday. We’ll have more comprehensive analysis over the weekend. Even if we don’t know what will happen tomorrow, we do know that fortune favors the prepared mind. Trade prepared. As mentioned earlier, I’ll be out of the office for a bit this evening. I’ll put together an update, but it may be abbreviated. In the mean time, I have the following random thoughts on the market to aid in preparation for Friday. our broader count is wrong. 10,184 is a key FibGrid level. At the lowest level we can count a complete move into that level. The large opening gap doesn’t allow us to count the first leg of the move up. Could be complete doesn’t mean it is complete. 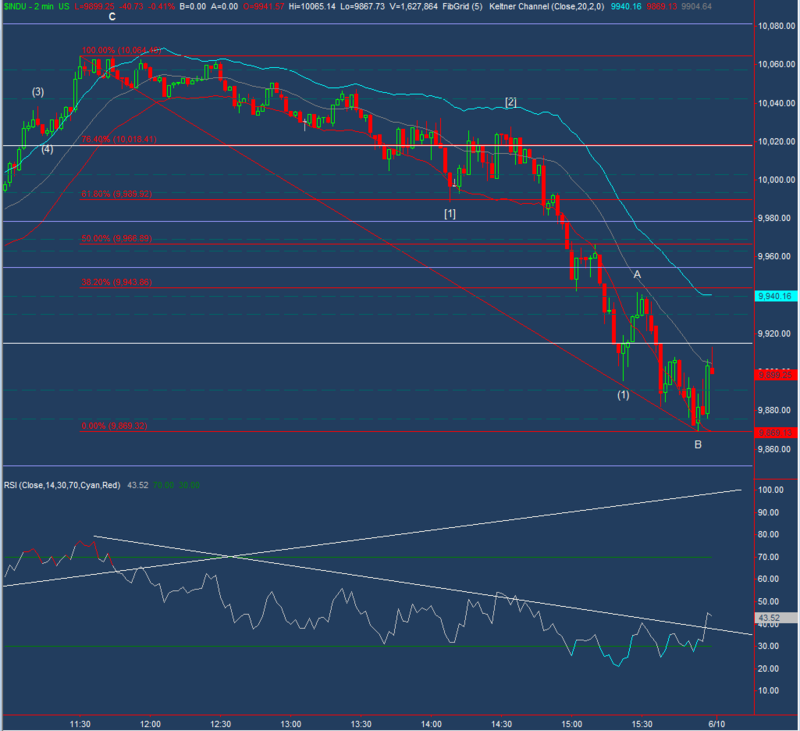 We didn’t see the divergences one would expect at the peak. I haven’t yet had a chance to run my individual stock scans. That might give some additional insight. We’ll definitely make portfolio updates later this evening. Several names stopped out today and our GS entry triggered. Hopefully there will also be a chance to try and reconcile technical indicators with wave count in order to prepare for tomorrow. However, it seems like we’re near a place where we either have to begin turning down or more upside is ahead in the short term, either as a larger correction or a more long-term bullish count. As waves continue to emerge, there are more and more strucutres that have fib ratios consistent with a target near our 10,184 FibGrid on the Dow. Having those proportional structures show the markets inherent knowledge of these levels. However, in itself, it doesn’t indicate a likelihood that the market will go up. However, the levels themselves have a sort of gravity, especially the important ones; there isn’t a level more important than 10.184. So having popped this close, one last touch may be in the cards. All speculation at this point. I’ll try to cover the ratios in more depth tonight. However, this next issue might be abbreviated. Have you had Skyline? The Cinicinnati chili, I mean? Sure it tastes great, but I can’t imagine it’s good for you and it can give some nasty heartburn. So while the Dow took a big bite out of the 10,120 skyline this morning, perhaps indigestion is why it’s having trouble on a retest. 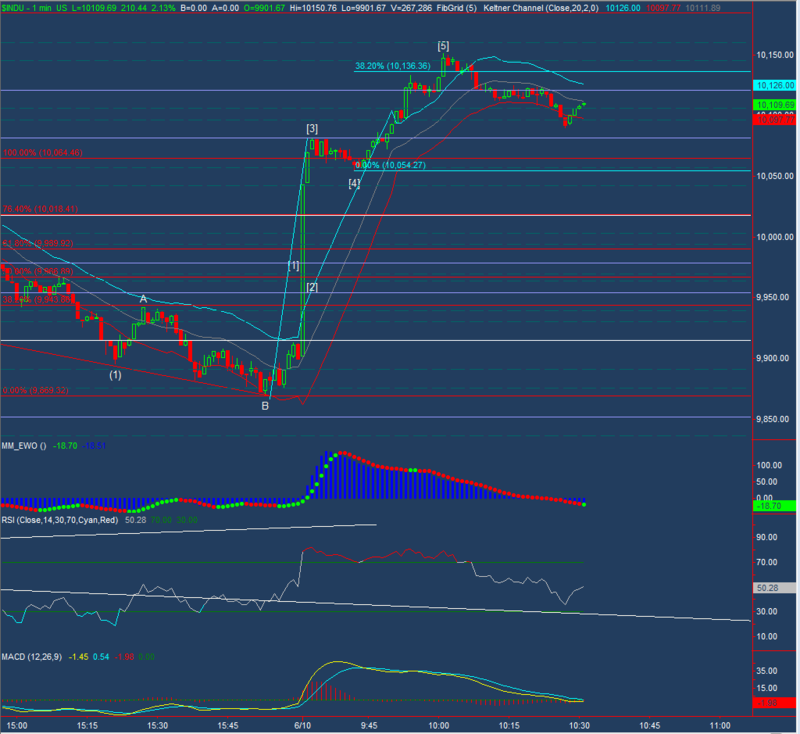 It’s retreat from those levels looks corrective, ocurring in three waves. However, attempts to push back up have been rebuffed. If it decides to weather possible stomach discomfort and head on up, then I’ll keep looking at that 10,184 level. 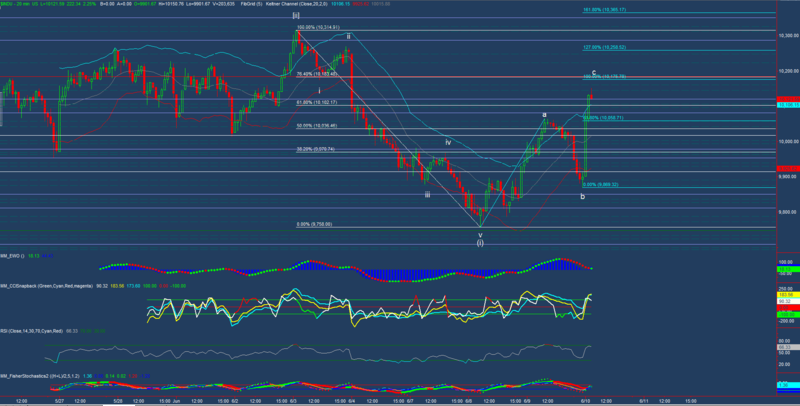 Continued chopping here might lead us to try and count a fourth wave triangle if it has the right look. If such a pattern develops then it would help give clarity to the wave structure and help us identify a possible turn down. At the moment it doesn’t look like that count has much chance of standing. The current move down from the point labeled  (likely incorrect) seems to unfold in three waves and being overlapped by a move upward. This is definitely a wait-and see moment. In these circumstances we can find guidance from larger proportions. Our FibGrid levels help as do Fibonacci relationships with larger waves. The market showed us early that our expectation are busted. The 10,184 fire line is at a 76.4% reteacement of the mvoe down from June 3rd highs and would also be near a=c for a revised counting of this correction . If we take out June 3rd highs then broader counts need to be reconsidered. The continued strength of pre-market futures as we approach the open suggests we’ll also see a deep retracement in the cash indices. 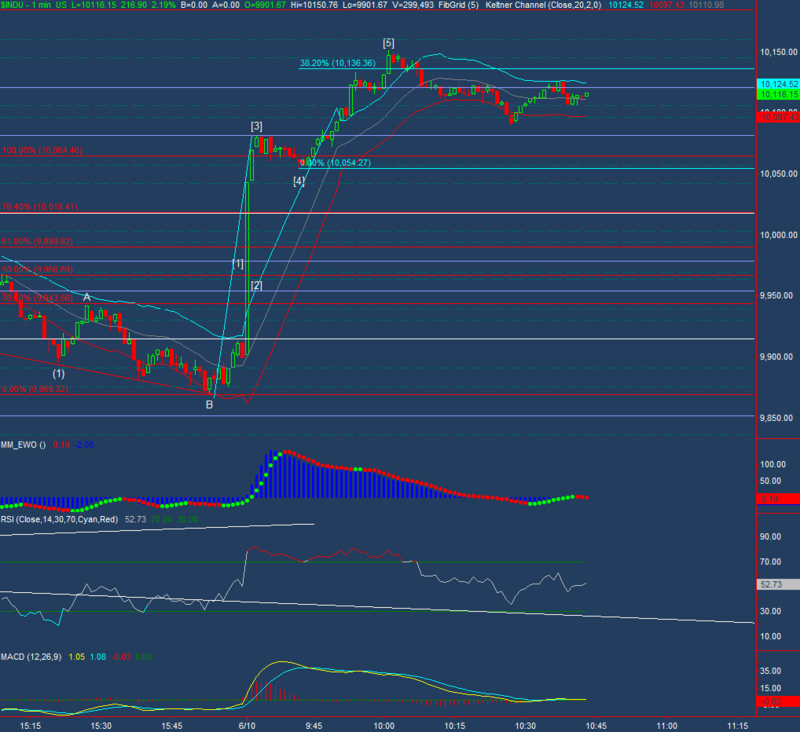 A 76.4% retracement of yesterday’s move down measures up to 10,016.41. It l0oks like our long-term FibGrid projection level will be in-play early on. As suggested in our daily commentary, watch this level.